When we went to the website for Custom Indoor Cycles their website states that their location is Santa Ana, CA. They state that they sell “Custom Indoor Cycle bikes” where you can choose the color and logo etc. However. The first red flag, and this is a small red flag, was that they don’t offer the famous Keiser bike. They only offer a “Stages” bike and a “Schwinn” bike. The burning question is, did Keiser decide to not do business with them, or, is there another reason? Again. That is a small, not a large–red flag. Not offering a very popular bike such as the Keiser bike is bizarre. Before we continue. We ourselves, had an awful experience with some “representative” from “Custom Indoor Cycles. All we did was to reach out to them. Because we “assumed” that a legitimate Indoor Cycling business will want to connect with us— an Indoor Cycling Magazine. Especially when we’re leaders and social influencers–for example, on Instagram, we own @IndoorCycling. In our opinion, we encountered an unprofessional and nefarious “representative”. We even felt attacked. For a moment or two–the representative, had us believing that we are selling pot. Or was he on drugs? LOL !! Now. Let’s return to objective and professional conversation. Remember above we mentioned a small red flag? Well now let’s talk about a LARGE RED FLAG. 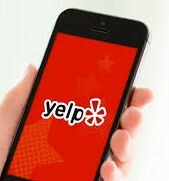 We found out that the business called “Customer Indoor Cycles” who will charge you up to 100 000 thousand dollars (or more) for the cost of a new Indoor Cycling Business, is not registered with the Better Business Bureau AND no where on Yelp Directory. That’s correct. Let’s repeat that in case you missed that. “Customer Indoor Cycles” who will charge you up to 100 000 thousand dollars (or more) for the cost of a new Indoor Cycling Business, is not registered with the Better Business Bureau AND no where on Yelp Directory. 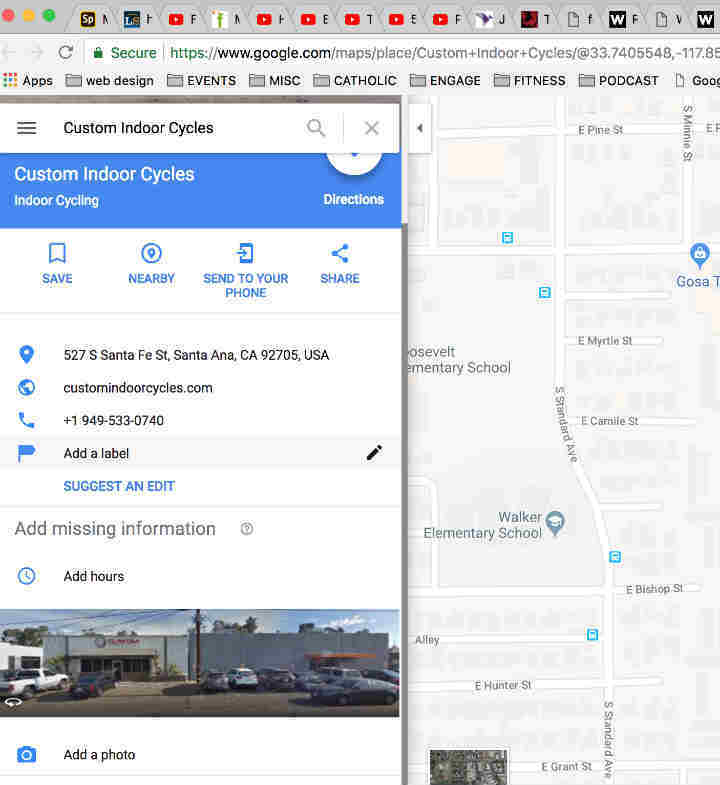 Just go the Santa Ana Better Business Bureau and search for “Custom Indoor Cycles” Here is the link to save you time. As such. Indoor Cycling Magazine recommends that you do business with a BBB Accredited business when purchasing Indoor Cycling Products or Services. Secondly. As we mentioned. 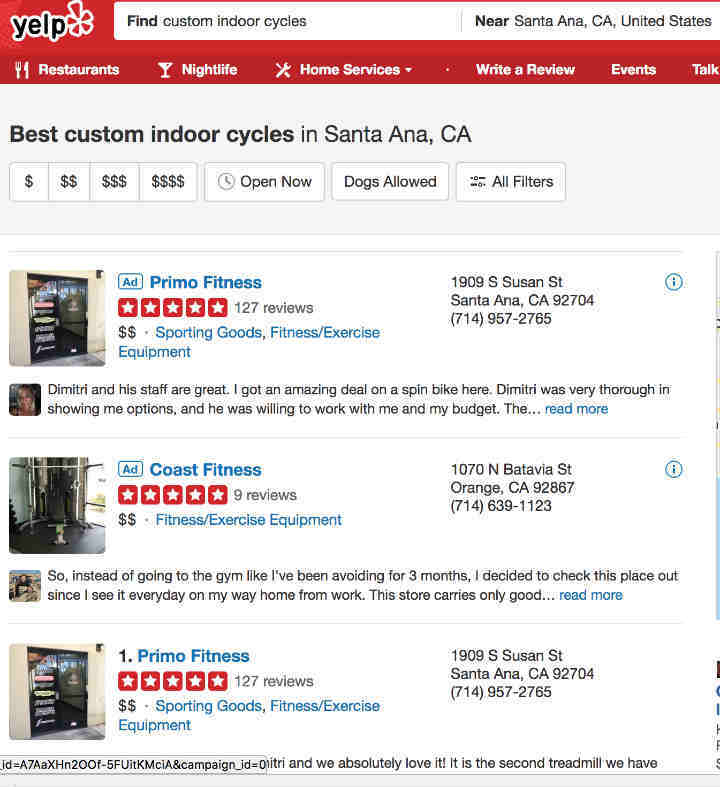 The second red flag is that “Custom Indoor Cycles” is nowhere to be found on the Yelp Directory. To save you time. Here is the link. However. We decided to save the best for the last. Here is the third Red Flag. We guess you have heard of Google? Well we went to Google Maps and tried to look up “Custom Indoor Cycle” on Google Maps. (Some call it Google Local). Thus, the largest RED FLAG was when we discovered that on Google maps they are very different then on their fancy website. Now compare that to a similar business that sells Indoor Cycles in Santa Ana. And the great news is that Primo Fitness sells Indoor Cycling Bikes. After reading all this, we are sure that you agree that Indoor Cycling Magazine truly cares about the consumer and more specifically truly cares about the consumer searching for Indoor Cycling Bikes and Services. We thank you for making us number one. And if this helps only one person we have been successful.